You recently discovered you are pregnant. As a teenager, you likely have a thousand questions running through your head: Am I ready for this responsibility? Do I want to be a mother right now? How will I tell my parents? How will the father of my baby react? Do I have the emotional or financial support I need? What about school, my friends, my life? Take a deep breath. You are not alone in this. There are hundreds of thousands of teen pregnancies each year, most of which are unplanned. Whether you are 15-years-old or going off to college this year, know that there are resources and knowledgeable professionals to help you along the way. Right now, you may be unsure if you are ready to parent a child. You may not know how having a baby can or will affect your life. You may not know about your other options as a teenager. 50 percent of teens today do not think about pregnancy or parenthood at all. At Adoptions With Love, we believe that being informed is the best thing you can do for both you and your child. We have created this infographic to show you the teen pregnancy facts and outcomes you should consider before making a decision regarding your child. We can also help you talk to your family. One of the first things to consider after discovering an unplanned pregnancy is how a baby will affect your life. Ask yourself if parenting is realistic at your age. Ask yourself if you have the finances and support you need to raise a child. Ask the father if he wants to be involved. Today, most teen fathers do not end up marrying the mother of their child. They also typically pay less than $800 a year in child support. Next, take time to explore your options. Despite being young, you still have the right to parent your child or make an adoption plan. If you are unsure or simply not ready for the responsibilities that come with parenthood, know that adoption is a positive option for you and your baby. When you work with Adoptions With Love, you can make an informed decision free of pressure. Know that we are here for you and will respect any decision you make. Only you know what is right for you and your baby. We are simply here to help guide, educate, and make you feel comfortable at every step of the way. Please do not hesitate to call us toll-free at 1-800-722-7731 or text us confidentially at 617-777-0072 for more information on our free services or your adoption options as a teen. 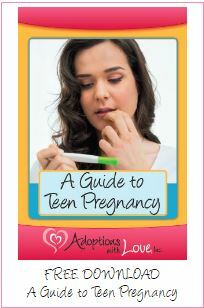 To learn more about teenage pregnancy, download our free guide below.